It’s been a week since the demise of Malayalam music director M.G. Radhakrishnan. Brother to singer M.G. 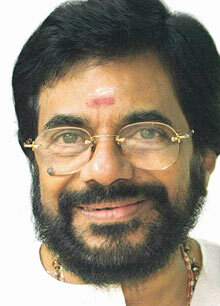 Sreekumar, Radhakrishnan was a stalwart in the Malayalam Music scene. His tracks had the simplest of tunes. Yet, they would capture every bit of your aural presence and take you to another level. The down-to-earth music director started-off composing music for the All India Radio. After the success of many songs he pioneered for the radio (including a popular radio show teaching music for listeners), he was invited to do the music for the Malayalam movie ‘thampu’. Soon, offers came pouring in, and Radhakrishnan churned out mellifluous tunes for many movies including ‘Manichitrathazhu‘, ‘Agnidevan’, ‘Devasuram‘, ‘Advaitham’, ‘Ananthabhadram‘, et al. He’s bagged the state award twice for ‘Achaneyanenikkishtam’ and ‘Ananthabhadram‘. I’ve forever been a fan of the musical maestro. I find immense solace in some of his tracks, in times of despair. My favourite MG track is ‘Sooryakireedom‘ from Devasuram – a haunting song that talks about the transcience of death and the uncertainity of life. The news of M.G’s death came a day late to me. M.G. is one of my favorite Music Directors, right after Raveendran. I actually had plans to interview M.G. for the papers, and a friend had even given me his contacts. In that context, the news of his demise pinned me down with despair and shock. I could not help but offer my tributes to the maestro who has continue to amaze me with his tracks. Here’s my cover a favourite M.G. Track. Song Name: Vande Mukunda Hare. The video of this song has Oduvil Unnikrishnan‘s character (Peringodan Shankara Marar) bids his adieu to buddy Mangalasseri Neelakantan (Mohanlal) – A feudal landlord,who stands wounded and decapitated after an ambush. Marar can’t bear the sight of watching his once-healthy mate now in tatters. The lyrics of the song make references to mythology: Kuchela is bidding goodbye to Lord Krishna, who meets death by a stray arrow after the destruction of Dwarka.